Scott Joss, author of The Joss Report, has over three decades of commodity / futures trading experience both on and off the floor. Scott Joss is currently registered as a Commodity Trading Advisor ("CTA") with the Commodity Futures Trading Commission ("CFTC"). Scott is also registered as an Introducing Broker ("IB"), and is a member of National Futures Association ("NFA"). He began his career in 1977 at the Chicago Board of Options and later gained experience in the grain pits at The Chicago Board Of Trade. In 1978, Scott began studying technical analysis using point and figure and enrolled in several technical analysis programs sponsored by the CBOT. In 1980, Scott started trading financial instruments and established several businesses. In 1984, Scott was called in as a specialist at the CBOT to work with New York institutional traders from Donaldson, Lufkin & Jenrette. In 1986, Scott - then an independent trader and introducing broker, became a member of the Chicago Broad of Trade and opened S.R. Joss Inc. His major client was Smith Barney for whom he provided technical advice to arbitrage 30 year bonds, 10 year notes, 5 year notes, bond options and Ginnie Mae's. Scott retired from the trading floor of the CBOT in 1991. In 1994, he reopened S.R. Joss, Inc., catering to retail clients. He found a niche teaching technical analysis while continuing to focus on improving his own trading techniques. Scott began developing chart-based trade recommendations and writing a commodity newsletter stressing risk management. Originally offered exclusively to Scott's own clients, The Joss Report has become required reading for traders who want a well-researched weekly game plan for the trading week ahead. Over the past thirty years, Scott has continued to develop his trading methodology using fundamental and technical analysis. 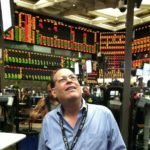 His philosophy is that to succeed in the markets over the long haul, traders needed to develop money management techniques that will allow them to survive losing trades and maximize winning trades; traders need to learn how to lose AND how to win. Scott believes that trading commodities is not a business of bold market predictions - but one of studying past price history and exploring market probabilities based upon fundamental and technical analysis... and human behavior. - Even the most successful traders lose money. Money management is the key to success. - Use common sense. Understand your equity to risk ratio. Risk small and stay alive. Subscribe today to 'The Joss Report', which includes The Joss Report's Weekly Trade Advisor each Sunday evening. The weekly report is a hands-on commodity trading Newsletter. Test-drive 'The Joss Report' and your new skills with a demo online trading account. No pressure, no tuition, no commission and no market risk! As your skill and confidence levels increase, so will your enjoyment of trading. Place live orders whenever you feel comfortable doing so. Why not get started now? Easy Online Commodity Futures Trading. The organizations and links presented in this website are in no way affiliated with ClearTrade. ClearTrade does not necessarily promote or endorse the services or publications described herein. Introducing Broker has no role in the production or review of these products or services and makes no warranty, either expressed or implied, as to their contents, accuracy or performance.